The Congress had aired a phone conversation between the woman and her friend, in which she spoke about Tejasvi Surya. 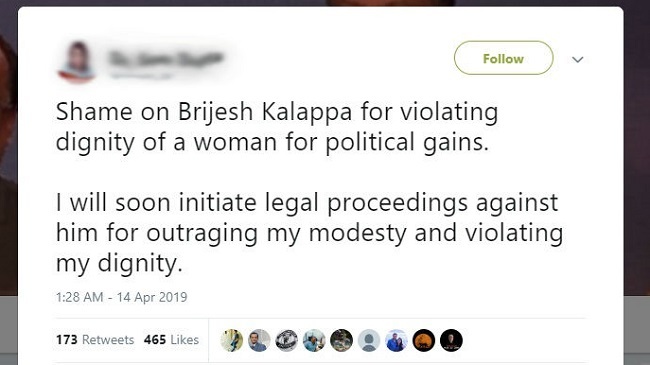 A woman entrepreneur from Bengaluru, who had taken to Twitter to allege that Bengaluru South BJP candidate Tejasvi Surya had physically harassed her, has now accused Congress spokesperson Brijesh Kalappa of violating her privacy. The woman is livid at the Congress for publicly airing a private conversation she had with a friend about Tejasvi Surya. On Sunday evening, Brijesh Kalappa held a press conference and released two audio clips of the phone conversation between the woman and her friend. In the audio, the woman is heard telling her friend that Tejasvi Surya had sexually harassed three other women and a complaint was filed at the Koramangala Police Station. She has now demanded an apology from the Congress party and has accused them of violating her privacy. Brijesh Kalappa, during the press conference had questioned the BJP as to why no action had been taken against Tejasvi Surya. “If allegations made by (name withheld) are true, the facts were there before BJP and RSS leaders and yet they declared Surya as the nominee. If the allegations are to be believed, under the Supreme Court-directed Vishaka guidelines, what steps did BJP/RSS take?” Brijesh Kalappa had asked. Brijesh Kalappa had also stated that the woman, now settled in America, had submitted a complaint letter to both the BJP and RSS in addition to filing a complaint with the Koramangala Police. He also stated that Tejasvi had violated the norms and not mentioned the case against him in his affidavit. However, the woman had deleted her tweets (tweeted during the last week of March) accusing Tejasvi Surya of assault, hours after she tweeted them. She had told various media houses that she was not interested in speaking further. “Shame on Brijesh Kalappa for violating the dignity of a woman for political gains. I will soon initiate legal proceedings against him for outraging my modesty and violating my dignity,” she said in a tweet addressed to Kalappa. “Stop this political witch hunt at my cost. I have already written to the Women’s Commission, clearly stating that I am not involved in this matter and any cases initiated on my behalf is done without my will,” she added. Kalappa was quick to respond to her tweet and said that he is willing to face any legal proceedings against him. “You’re welcome to initiate legal proceedings. Will be happy to face it. You will, however, find it an uphill task to prove how I have violated your dignity or that of any woman for that matter. My best wishes to all your endeavours including legal action against me! !” Kalappa said in a tweet. This was followed by a Twitter war between the woman and Kalappa where she demanded an apology from the Congress and Kalappa himself. “You are obviously a woman of great eminence. I respect you. This conversation has been heard by millions, having gone viral over the last 2-3 days. I had a PC (press conference) only this morning. If you think I had first-hand access to this conversation, you are mistaken,” Kalappa added. The woman also told Kalappa that she was not aware that the conversation with her friend was being recorded and that she was being coerced into giving him information. “Sir, as an advocate you know very well the conversation was private and I was egged on by the guy. I didn’t authorise him to publish it. The whole conversation was an instigated one and also private,” she said. Kalappa went on to state that by tweeting that the audio clip was a conversation she had with her friend that it was in fact authentic. “Madam, the moment you concede that the conversation is authentic, you concede that all my three demands are justified. Please don't bother to delete this tweet. There would be half a dozen screen shots taken already!” Kalappa added. On March 26, Tejasvi Surya’s nomination was confirmed after which the woman had tweeted about the harassment, she had faced at Tejasvi’s hands while they were in a relationship. 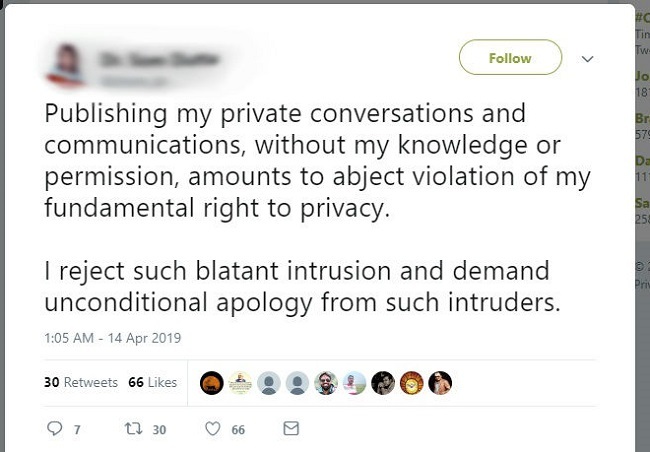 She, however, deleted the tweets stating that she did not want to cause her family any trouble and that she did not wish to talk further about the issue.